This week I decided to be wildly different and not only linkup with Vicky from Books, Biscuits and Tea but also show what I read. Answer - Not a whole lot. I got 2 nonfiction, 1 romance and 1 mystery e-ARCs. I have a weakness for Russian history especially Romanov history. Twelfth Night by Deanna Raybourn - I read her historical kind of romance last week (Review) and enjoyed it so was thrilled to get an opportunity to read one in her mystery series. Suddenly Last Summer by Sarah Morgan - I have a friend who loves this author plus it involves a chef. Looking forward to reading it. This one is a little better. I really wanted to participate in yesterday's read-a-thon but ended up kind of chickening out. Next year though! And Then He Kissed Her by Laura Lee Guhrke - This is basically comfort reading for me. I picked it up when I wasn't feeling well Friday. The coffee table sized book sounds interesting! 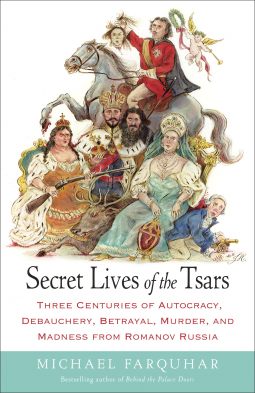 I'm hoping the Romanov book is good. I don't know that much about them but am intrigued. I'm hoping next year I'll do the readathon. I found out in time but by the time I decided that I could do it it was too late to make proper preparations. Thanks for stopping by on my showcase yesterday! The main problem I get with reading a bunch is sometimes it makes it hard to get really involved in one because you're reading it in bits and pieces. I think I would've liked Attachments more if I had focused on it from the beginning. YAY, Attachments! My favourite Rowell book. Hope you loved it. I did end up loving the last 60% or so though it took me awhile to get into it. My tastes tend to be somewhat eclectic!